My research and scholarly creative work is concerned with the role of visual communication design at the intersections of creative disciplines. Creatively, I am interested in integrating methods of design and artmaking to create work and products in new, meaningful, and emotionally impactful ways. The desired goal of this research is to eventually establish methods and tools for understanding, modeling the process of designing for education, and how the design of educational tools and systems can affect understanding, literacy, and awareness. This direction has taken me down two paths thus far. 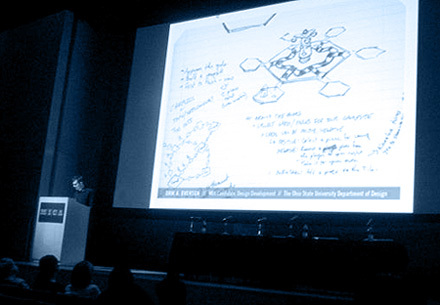 The first involves educational games, digging into the specifics of game constructs and rule systems that make them a unique vehicle for delivering information. This branch topic focuses on the ability of designed interactive media to communicate, and how this can be applied to fulfill educational objectives. I have published and presented the results of this research at conferences throughout the USA and Asia. The results of my graduate thesis work are a featured case study in the design research textbook, Convivial Toolbox: Generative Research for the Front End of Design, by Dr. Liz Sanders and Dr. Pieter Jan Stappers. The second involves the language of comics and visual narrative, and the related implications of this language in fulfilling educational objectives. This research focuses on the specific ability of the graphic storytelling form to educate, and how this can be applied in the classroom and to the field of information design. My research has involved both quantitative and qualitative methods, including heuristics, usability studies, co-creation models, and generative tools. It also touches on topics such as dual-coding theory, user experience, narrative theory, and semiotics. It is borne from professional practices incorporating visual narrative, information design, and branding, as well as a lifetime spent sitting just outside the field of education, observing. Quality indicators of my research include acceptances to peer-reviewed journals and major conference presentations. ​Related creative work (applied research) includes educational graphic novel Gods of Asgard, teacher workbook Super-powered Word Study, and educational card game Marrying Mr. Darcy. These materials have been used in educational contexts at the Field Museum of Natural History, the Wexner Center for the Arts, James Madison University, Marshall University, and Gustavus Adolphus College. 54th International Congress on Medieval Studies, Western Michigan University, Kalamazoo, MI. Dept of English, University of Florida. ​Polytechnic Summit 2019: Shaping the Future of Polytechnic Education, University of Wisconsin–Stout, Menomonie, WI. Collaborator + co-presenter: Dr. Andrew Boysen, Jr.
HIST 218: Scandinavia to 1800, Gustavus Adolphus College, St. Peter, MN. Dr. Glenn Kranking, instructor. “Gods of Asgard” used as text. ENG 200: Texting the World, Marshall University, Huntington, WV. Dr. Tim Burbery, instructor. “Gods of Asgard” used as text. ENG 401: Advanced Studies in Medieval Literature: Reinventing the Middle Ages, James Madison University, Harrisonburg, VA. Dr. Dabney Bankert, instructor. “Gods of Asgard” used as text. REL 200F, TP: Norse Religion, Carthage College, Kenosha, WI. Dr. Karl E. H. Siegfried, instructor. “Twilight of the Gods” used as instructional tool.